So I am off to Ranthambore for the new year - will put up pix once I return. I have really been ignoring my blog for some time - I guess its partly because of Twitter and partly because of Dragon Age :) Another thing - I simply share stories via Google Reader Shared Items to my Twitter account using TwitterFeed, so that dampens my enthusiasm to create a blog post of related links like I used to! I.e. Whatever comes into my head at a moment of time. Hopefully not inane stuff. Updated in spurts. Who? Ashish Vashisht (a.k.a. MoGlee). 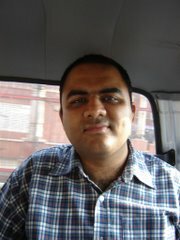 I am a software professional living in Hyderabad. The views expressed here are my own, not of any of my past or present employers.